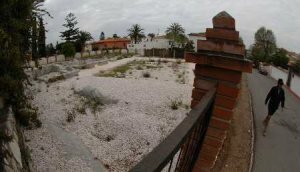 One year under plastic – Villa Romana restoration moves at a snail’s pace | Marbella Marbella – Adelante! For more than one year it has been sleeping under plastic and gravel, but Villa Romana de Rio Verde, one of Marbella’s most important historic sites, is expecting to recover some of the splendour that it once treasured. Historians believe it was built in the first and second centuries and was first used as storage for ‘garum’, a fish-based sauce that was precious to Romans as an exotic cooking ingredient, transported by sea in large amphorae. Little else is known about the use of this house, and its past is woven with a lack of detail. Its future is just as uncertain. It has already been sixteen months since the City Council approved the cleaning and consolidation of the site, declared it a Site of Cultural Interest (BIC), and covered it with plastic and gravel to prevent damage in the hope that the Ministry of Culture would construct walkways for visitors. ‘We’ve spent years asking for this building and the installation of the walkways because people would lift the tiles with their feet. At best, the tiles did not break or go missing’, says Catherine Urbaneja, a member of the Historic Heritage Defense Association of Marbella, also known as ‘Cilniana’. The walkway project is in the pipeline and has administrative and financial support. Some 101,000 euros have been set aside for the work, so the question is when the plastic will give way to the engineers. Sources in the Andalucía Delegation of Culture say work will begin in the second half of 2010. The same sources also stress that ‘this project is a priority for conservation in the province’. For Cilniana, that assurance is nothing more than a statement of good intentions. ‘The government cannot take so long to give value to a project that it has praised so highly and now speak with such ambiguity about when work will begin’, Urbaneja says. ‘The Board shows a bit of indifference to one of the jewels of our heritage’. The City Council also says it regrets the delay. “We quickly began preparing the environment, but the visits we have been promised for over a year have amounted to nothing’, says Carmen Diaz, the municipal official for Culture. However, Diaz remains optimistic that restoration will not only be finished in the Villa Romana, but also in the Paleo-Christian Basilica of Vega del Mar and the Vaults of Guadalmina. He envisions a day when there will even be an interpretive centre, an old Cilniana demand. Now, only time will tell.